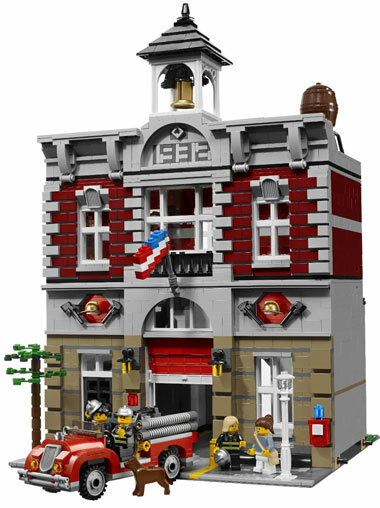 Lego’s Fire Brigade is the oldest of their current line of modular buildings. The model is built from 2231 pieces, and I’m told that the construction is challenging and highly enjoyable. The Fire Brigade features a 1930’s-style fire truck, 4 minifigures, a fire-dog (a Dalmatian would have been cooler), and tons of great details. The completed model is 14″ tall and 10″ wide, rated for 16+ builders, and is priced at $150. After having an eye on the model for some time, I got a brief scare the other day when Amazon and ToysRUs sold out of the set and Lego’s online shop reported that the set was no longer available in the US. My local Lego store sold 6 sets to a reseller who bought them all up in the 25 minutes it took me to get down there. I was able to order a set from Lego over the phone, but was told that supplies are dwindling and are extremely limited. It looks like the sets are once again available online, but there’s not telling when the set will be discontinued for good, especially if resellers make a dent in the remaining supplies. I did get the fire brigade, it is awesome, very fun to put together and really playable. My only suggestion is to pay attention to the color of the pieces you put in, I got almost to the end and had a few missing pieces, or off colors, I was able to correct it, but it annoyed me for a little bit. I also like the look of how the Grand Emporium is designed. The arched supports at the top look particularly interesting, and I cannot wait to see how that goes together as well.